No Fry… What you really need is beer. An impending snow storm is descending upon the Northeast and in my area we are looking to get at least a foot of snow. That means everyone is running out to get the three necessary food items before huddling inside: Bread. Milk. Eggs. But beer drinkers have their own unique needs and I have three for you. Bread: Toaster Pastry by 21st Amendment is an India Style Red Ale brewed to celebrate their big expansion into a former bakery that made toaster pastries (read: Pop Tarts). I had this beer about a month ago. It is hard to find and it was a little on the pricey side but worth every penny. 21st Amendment uses biscuit malts that gave the beer a great bready flavor. Balanced between malty and sweet juicy hops left me in love with this beer. The mouth feel was thick with a great long finish. Toaster Pastry is an absolute killer. Milk: Lancaster Milk Stout by Lancaster Brewing Company. I feel like in the Central PA beer scene the folks at LBC sometimes gets forgotten. LBC has been around making great local craft beer for so long now that they easily get forgotten among a culture that puts a high price on “new.” This beer, LBC Milk Stout, has been standout for a great Lanacster brewery for years and I every time I have one I wonder why I don’t order these more often. Hints of chocolate and coffee, but it is really all about the thick and creamy mouthfeel. A slight sweetness comes in the finish to compliment the pleasantly bitter notes from the front. It’s a great example of how to properly brew a milk stout and properly represents the brewery’s namesake, Lancaster County. Eggs: The Martians Kidnapped Santa Egg Nog Stout by Spring House Brewing Company is a sweet stout and one of my favorite beers in Lancaster County. Spring House has a knack for making great stouts. I think they have a great stout base and that they play off this with an impressive number of variations, each one better than the last. Kerplunk! Coffee Stout, Satan’s Bake Sale Mint Chocolate Chip Stout, the transcendent Blood Lust RIS, and the twin killers Big and Lil’ Gruesome Stout. Martians Kidnapped Santa is still available at Spring House and in the Central PA area. If you have yet to enjoy some this year, get on it as it is a fantastic winter stout. The flavors of heavy cream, vanilla, nutmeg with a whiff of cinnamon come through from nose to finish. If you can’t find any of the above or want the easy choice, grab a case of my absolute favorite Central PA beer, Nugget Nectar (in the cans). Nothing will beat tilting a couple of these back with a bowl of chili after shoveling the drive way. East End Brewing Company and Pizza Boy Brewing represent the two areas of Pennsylvania that matter to me personally. Over the past decade plus I have spent more time on the PA Turnpike than I would like to admit traveling between my old home (Pittsburgh) and my new home (Harrisburg and later Lancaster). East End has been making phenomenal beers in Pittsburgh since 2004 and are at the center, geographically and metaphorically, of the region’s craft beer surge. Al’s of Hampden was where I discovered the funk and the sour of craft brewing; either through Al’s wonderfully curated offerings, Pizza Boy Brewing or Intangible Ales. It has been where I know I will find great beer here in the Harrisburg area every time. It’s bullet proof. So when Al teamed up with East End to make a Berliner Weiss I knew I would have to check it out. 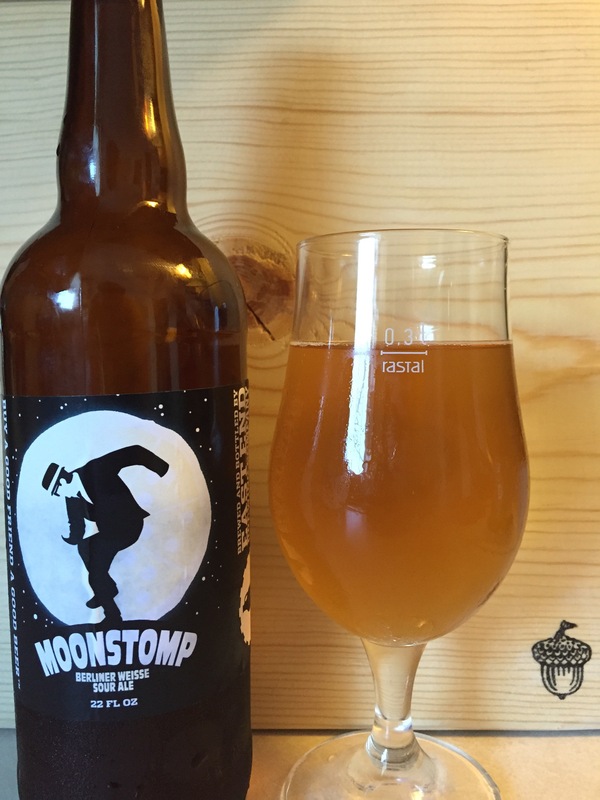 Moonstomp (named after a Reggae song) is a cloudy straw colored beer. The brew was crisp and refreshing. The nose was similar to that of Big Hop, an exceptional pale ale by East End and was fragrant of apples. The light bodied and effervescing brew had an easy drinking character. The flavors of apple and slight bits of lemon along with a pleasing mouth feel made this beer inviting; while the long slightly sour finish made it slow going. A palate-cleansing tartness of lactic acidity sold this beer to me as perfectly executed. A fine collaboration and bringing characteristics of both brewers to the final product, it is highly recommended. Moonstomp is currently available at Al’s both on tap and in 22 oz. bombers. It will see a limited release on Saturday at East End. You will want to arrive early for this one if you are in Pittsburgh. 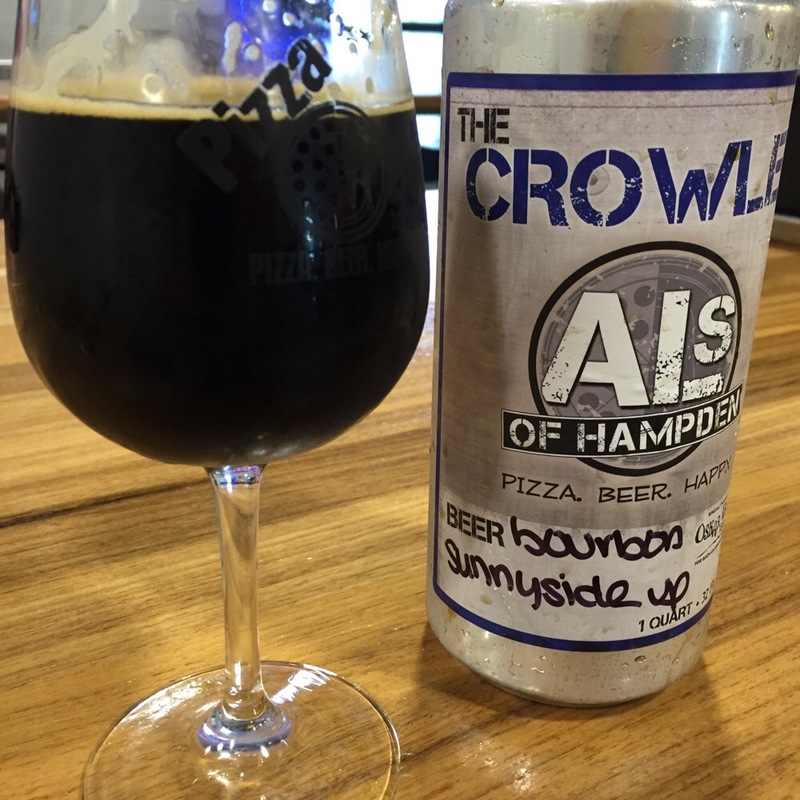 Al also released a bourbon barrel aged version of his beloved Sunny Side Up Stout. This coffee stout was aged for about four months in Woodford Reserve barrels Reserve barrels and yesterday ten and a half kegs of it were tapped starting at 11 am. Glasses and Crowler fills sold out the allotment before the dinner rush ended. The numbers on how much was sold as figured by my friend Jeff… were in a word, amazing. Al was apologetic on social media about selling out half the stock so quickly. He need not be. The beer was fantastic. Served in a wine glass, the pitch black stout shortly held a mocha brown head and smelled lightly of bourbon, vanilla and cold coffee. In the front, it tasted of chocolate, coffee, and roasted malts. The bourbon flavors of vanilla, caramel and oak come along to finish and linger pleasingly. The full bodied beer never gives up a burn or astringency despite the 10% ABV or the long rest with the spiritus frumenti. This is barrel aged beer done right. The aging process expanded the character and flavors of an already exceptional beer. 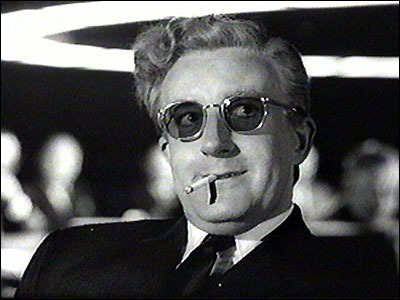 It added depth and complexity and never diminishes the base. Al will be tapping this beer again today (7-30-15) at 4pm. It will be available by the glass and in 32oz Crowlers to go. (Special thanks be given to Zeroday for helping out in this regard.) Get to Al’s early. This will sell out. 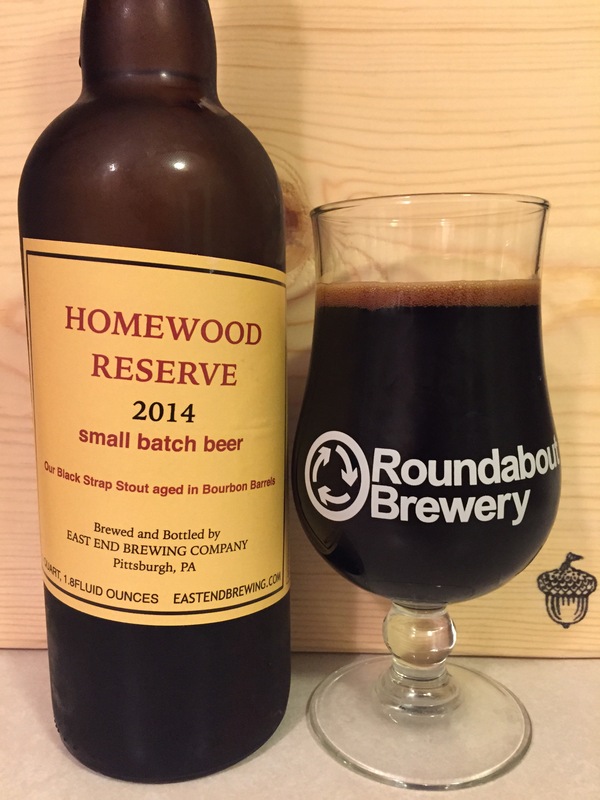 In order to bring this posting full circle I also decided to crack open one of my two bottles of Homewood Reserve (2014) that I have been sitting on. This bourbon barrel aged version of Blackstrap Stout by East End was a fine compliment to the Sunny Side Up. It too played with the subtle end of the barrel aging spectrum. The nose is thick of roasted coffee and hints of bourbon. Medium bodied and lighter than the Sunny Side Up. Homewood Reserve was lightly carbonated but with microscopically small bubbles. Easy drinking for an aged stout it had a long and very dry finish of coffee, vanilla and slightly of wood. As the beer warmed up, just a faint burnt smokiness entered with an almost peaty character. The most interesting flavor was a mineral like taste that would be akin to a full bodied deep red wine. This was both surprising and pleasing. A great beer. The thread that weaves all three beers together beyond the collaboration between the two breweries and the similar styles is the understated approach to flavors. These beers work at the edges. Never being over powering with any one taste. Instead they gently suggest various impressions of the ingredients and processes used to make the final product. This is brewing at a high level. 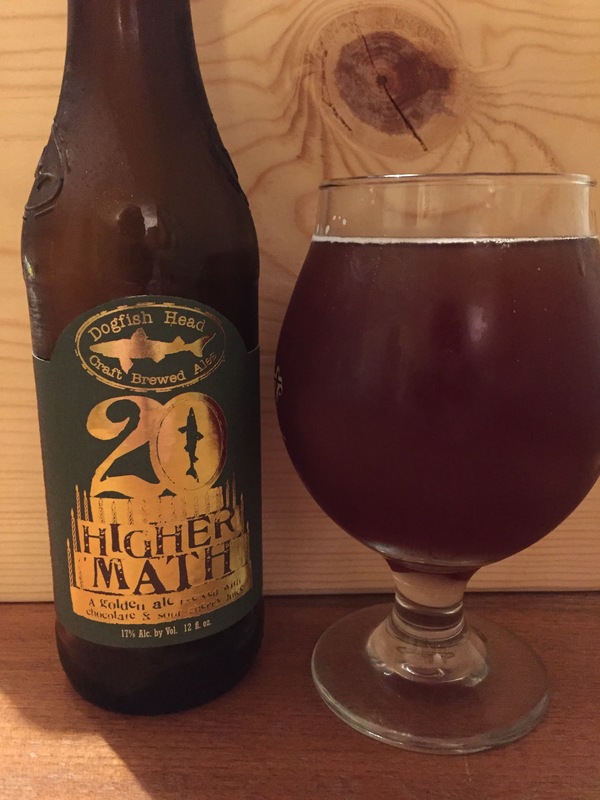 Post Script: Beer geeks frequently talk of chasing “whales” the seemingly unobtainable beers that many covet. Usually these beers are from far off states sold in incredibly low volumes. I am generally dismissive of these snow flake in hell type beers. I stopped chasing “whales” a long time ago. But there are “whales” to be had in our own backyard. I just had three of them. We need to recognize the quality we have locally and cheer this as a grand success for the craft beer community here in Central PA.